True Sport - More Important Now than Ever! With the Rio 2016 Summer Olympic and Paralympic Games right around the corner, excitement is growing like wildfire! We'll be cheering on athletes from our hometowns as they compete on the world stage. As we witness all of the amazing athletic performances happening in Rio, it's important to recognize some of the fantastic sport initatives happening in our own communities. While the Olympics bring the sporting world together, local sport brings our communities together. In this issue, you'll learn how good sport is making a great difference in Manitoba, the connection between community sport and belonging, and more! The Olympics are full of True Sport moments. See one? Post it! The Olympics are full of moments that remind us how great sport can be. An athlete who ‘goes for it,’ competitors who ‘show respect’ towards each other, fans who ‘have fun,’ and so many others! Whenever you see a moment during the Games that reminds you of one of the many True Sport Principles (Go For It, Play Fair, Respect Others, Keep it Fun, Stay Healthy, Include Everyone, and Give Back), post it on Facebook and/or Tweet it using @truesportpur and # + the principle at play. Let's see how many other Canadians share and believe in the same principles you do! #TeamCanada - go to www.olympic.ca. By sharing our Olympic athletes’ stories, we inspire all Canadians through the power of sport. Follow the journey on Twitter, Facebook, YouTube and Instagram. Watch Team Canada - Ice in our Veins. “Sport Manitoba looks forward to working with our partners in sharing the True Sport message with the greater Manitoba sport community. Good sport can bring so many positive things to a community. True Sport is another valuable tool as we continue our work with our sport partners and the tremendous network of athletes, coaches, officials and volunteers in Manitoba.” Greg Guenther, Senior Manager Sport Development, Sport Manitoba. 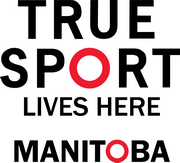 “The principles and values of the True Sport Lives Here Manitoba just make sense. Every parent wants his or her child to compete in a positive, character-building environment, which can have a lasting impact. We forget that participating and competing in sport should ultimately be one thing: Fun. We need to return to respect in sport: respect for each other on the fields, on the ice, and in the stands." Dr. Glen Bergeron, Acting Dean of the Gupta Faculty of Kinesiology and Applied Health at the University of Winnipeg. Community Foundations of Canada and the True Sport Foundation released an in-depth report that explores the role of sport in building belonging in our communities.